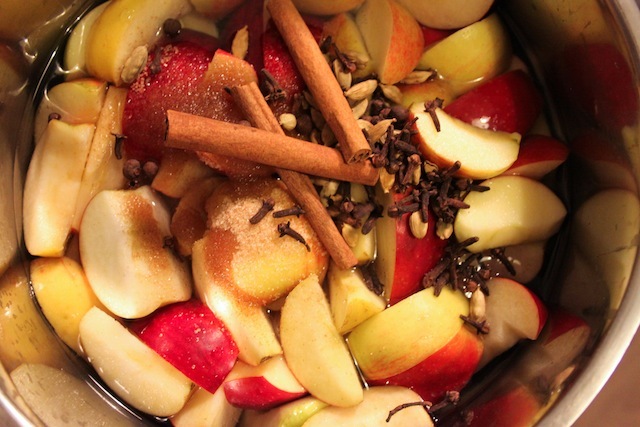 Smells Like Fall: Uncle Richard’s Apple Cider – Eat Me. Drink Me. It is one of my last evenings living in Neukölln, and I’m feeling prematurely nostalgic about the scratch of car wheels roughing up rain outside my ground floor window, the headlights shining in through the curtains, the soft glow of lights in my little room, and the way it’s always cold no matter how much you wear. For that reason, and because hot drinks are so well suited to nostalgia, I’ve warmed myself up a cup of homemade apple cider and am sitting here at my desk researching moving truck prices and trying to figure out what Kbpi/s means. I made my first batch of homemade apple cider last week, listening to soft music and letting the warm smell of cinnamon waft through the apartment. A few weeks before that, my uncle had sent around an email with his recipe for apple cider. My uncle, who lives in West Virginia, is an avid and experimental cook, reconstructing his favorite dishes by taking them apart and building them back up again. I store the recipes in an email folder, saving them for a rainy day or an alignment of the proper stars. I have yet to try the French onion soup, Moroccan-style boneless pork ribs, and Pho broth, but this fall in Berlin has been gracious, and that’s enough stars to spend a day with a pot of cider simmering on the stove. I’ve never been much of an apple person. Or rather, I’m a very picky apple person. I grew up in rural Pennsylvania where the apples are grown. Just half an hour away from home were rolling hills with gnarled apple, peach, pear, and other fruit trees and the equally rolling roads were lined with stands selling fresh fruits and vegetables. My mom would bring home large paper sacks stuffed with apples and bake her famous apple pie, partly so famous because of the excellent apples inside. When you’ve eaten a freshly plucked, unwaxed apple, you can never really love an apple from the grocery store again. It’s still a phenomenon I don’t understand – how the best foods from a region are shipped as far away from it as possible so that the people who live there are buying the same thing from thousands of miles away. At my beloved Russian grocery store down the street, which I’ll have to abandon soon, I found small, green apples from Poland, delightfully pockmarked and imperfect, as well as some other, larger and sweeter varieties. The smell of them cooking down on the stove reminded me of those apples from home and my mother’s pies – the apple harvest festival we used to go to in the fall where there were ponies and tractors and vats of steaming apple butter. That’s the beautiful thing about smells – they can take you to a place, take you home. And they can also help you make a home. I’ll have to make a batch of cider in the new apartment, too. 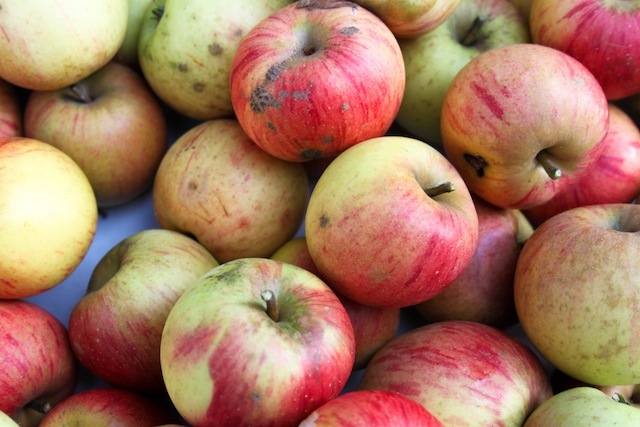 Like pie, cider benefits from the use of a variety of different apples. For sweetness, try Fuji or Hudson’s Golden. For aroma, add a Golden Delicious or Turley Winesap. There are countless varieties of apple, including heirlooms. Mix and match for the richest cider. Lightly toast cinnamon, cardamom, cloves and allspice in a small pan until fragrant, about 3-5 minutes. Be very careful not to allow the spices to burn. When toasted, set aside. 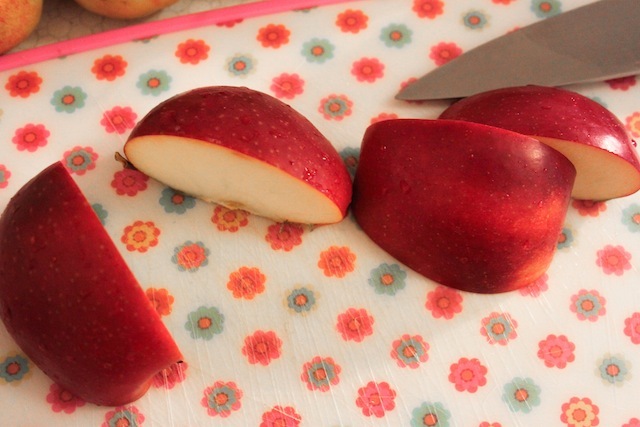 Wash apples, then core and slice them. Don’t worry about removing the skin. 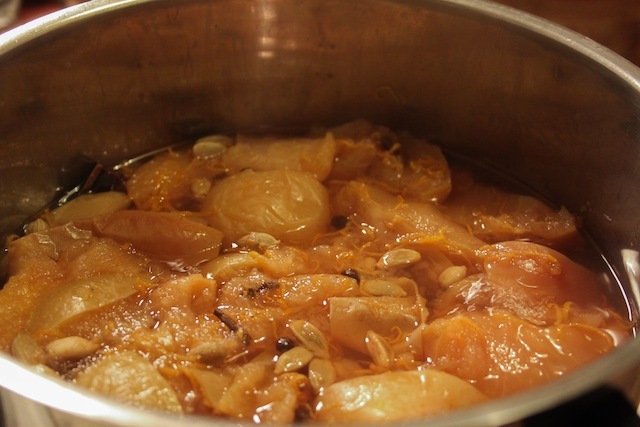 Place apples in a large pot with toasted spices, sugar, orange and zest. 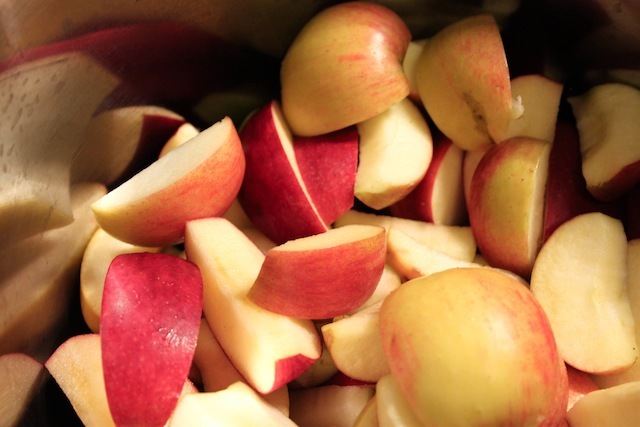 Add enough water to just cover the apples and then about ½ cup extra. Bring to a boil and gently stir. Reduce to low heat, cover, and simmer for 3-4 hours, stirring occasionally. After 2 hours, taste the cider. If it still tastes very watery, remove the lid for 1 hour to evaporate some of the liquid. 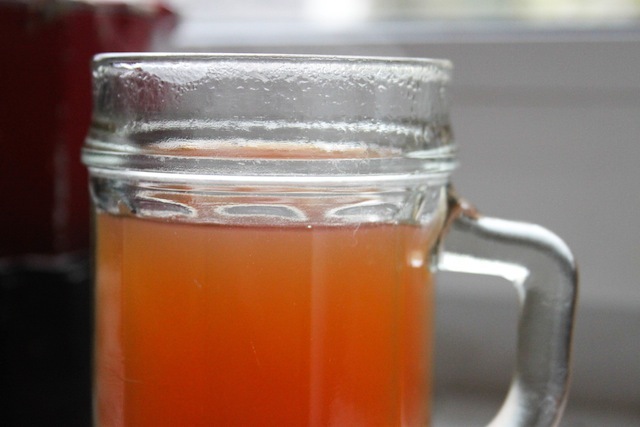 Be sure not to leave the cider uncovered on the stove for too long, or else your cider will taste too much like spices, and too little like apples. If, at the 3-hour-mark, your cider isn’t sweet enough, add 1-2 tbsp. raw honey. When you’ve tasted the cider and deemed it ready to drink, ladle the apple pulp and spices out of the pot and strain through a fine mesh sieve. Repeat the process twice to remove as much of the pulp and keep as much of the juice as possible. Any pulp without whole spices that’s leftover can be eaten as applesauce. 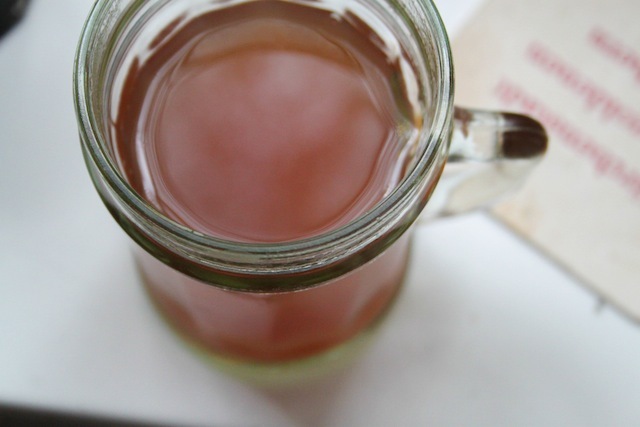 Straining the pulp through a bread towel at the end will leave you with as light and clear of a cider as possible. Serve warm with a shot of Cointreau to bring out the orange. I can smell it… ummmmm. Twice now I’ve had to smell it cooking without tasting it: when he wrote it and now you. I always associate being in PA for the holidays with smelling and drinking spiced apple cider that your Mama would make. For some reason, I’ve never made it myself . We’ll have to make a batch at Christmas! The recipe is still in revision, but honored you gave it a go. A girl told me it (this version) was similar to a chai tea, and . . she was correct. Drop the cardamon and it should take care of that. Today is the last day of our farmer’s market, and buying a box of apples for the next attempt(s). The nice thing about apple cider is that each batch is a little different – I think I overdid it on the spices this attempt – definitely the cinnamon (I adjusted for that in the recipe above) – but I actually like the warm, chai feeling. It reminds me of the apple version of German Glühwein.